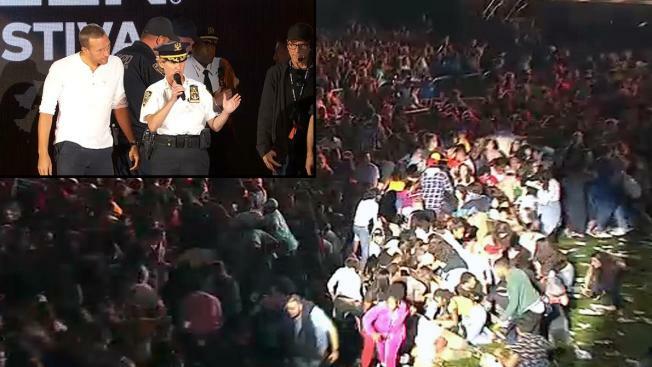 Someone stepped on a bottle which made a popping sound that spooked attendees of the Global Citizen Festival in Central Park, organizers said. Police originally said a falling barricade caused the panic in the crowd of about 60,000 people on Saturday night. But on Sunday, Hugh Evans, the CEO of the festival, said the initial scare began when someone stepped on and popped a drink bottle or bottles. Others thought it sounded like gunshots, he said. As people hurried toward the exits, some were injured, Evans said. "We regret that this incident marred an otherwise impactful event," Evans said. In the chaotic moments, Coldplay's Chris Martin came on the stage to calm the crowd. The show continued minutes later with Cynthia Erivo singing "A Bridge Over Troubled Water." Then the show was halted again while police re-established the security infrastructure. Some people weren't able to get back in the park to see the rest of the concert, Evans said. "For that, we apologize," he said.